On Saturday morning, farmers markets around the country will be offering many fresh delicious veggies. Make sure to pick up 2 good-looking zucchini’s for this bread! You won’t regret it! 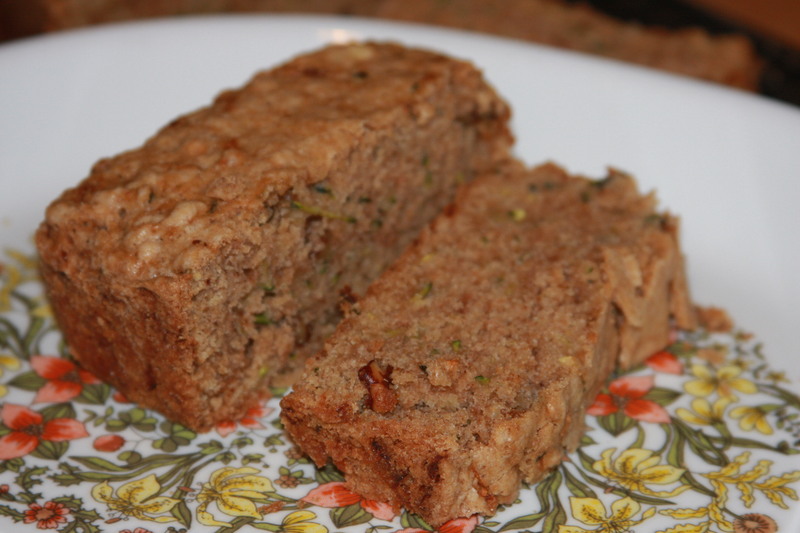 I recently found myself baking more zucchini bread. 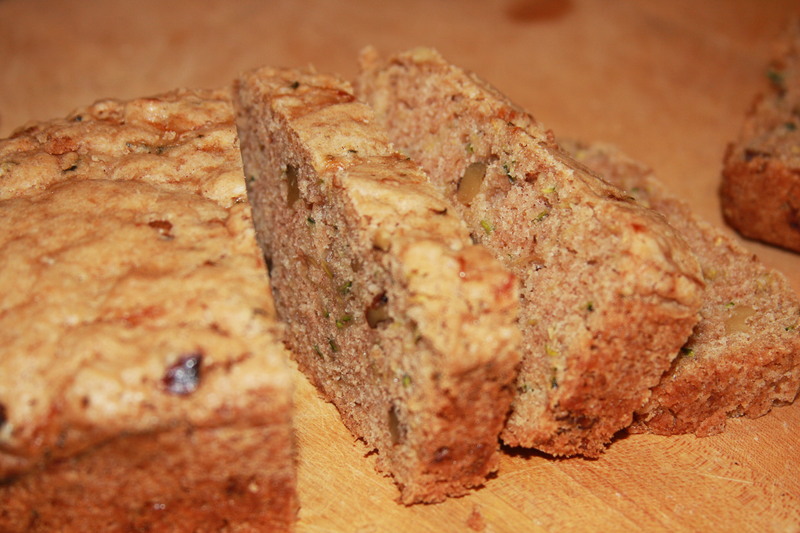 (I also have a delicious zucchini bread/muffin recipe that uses spelt flour, if you prefer!) I guess the kids and I were ready for a snack… because in less than an hour from being out of the oven, the loaf was already half gone! This recipe is definitely one to be made repeatedly and to be shared! It is great for all seasons, freezes beautifully & also makes a nice gift (if you do that kind of thing)… plus my kids absolutely eat it up! I have used this recipe to make both loaves & muffins. In fact, this bread is SO great, I would recommend that you go ahead and double the recipe so you can freeze a loaf! This bread actually forms an amazingly soft sweet “crust” on top that literally melts away in your mouth! This recipe is slightly adapted from The Joy of Vegan Baking, by Colleen Patrick- Goudreau. I highly recommend purchasing this cookbook. It actually won Cookbook of the Year from VegNews magazine in recent years and every recipe I have tried is fantastic! Mix the dry ingredients separately in a large bowl. Add nuts, if using. Using a rubber spatula, mix the wet into the dry. (Try not to over-mix, which causes a tougher bread that isn’t as fluffy… definitely don’t use a whisk here!) Disperse evenly between 12 muffin cups or make one loaf. Bake until a knife inserted in center of bread comes out batter-free. This entry was posted in baking, breads, muffins, snacks, Vegan and tagged vegan zucchini bread, vegan zucchini muffins, zucchini bread, zucchini muffins. Bookmark the permalink.